RadChat for ASP.NET AJAX is a control is a server-side wrapper of the Kendo UI Chat widget. The control allows for integration with any Bot framework, due to its simplicity, flexible API and customizable templates. RadChat is available as of R2 2018. Figure 1: A simple RadChat message flow. This article provides a brief overview of the main features of the RadChat control. Flexible client-side API - The flexible API allows an easy integration with Chatbot services. Default Cards - Built-in support for "HeroCard" template messages which can be displayed in the chat flow. Default Actions - Out-of-the-box support for Suggested Actions/Quick Replies. Custom Templates - Possibility to define custom templates for messages and suggested actions to fit any custom payload, returned by the service. 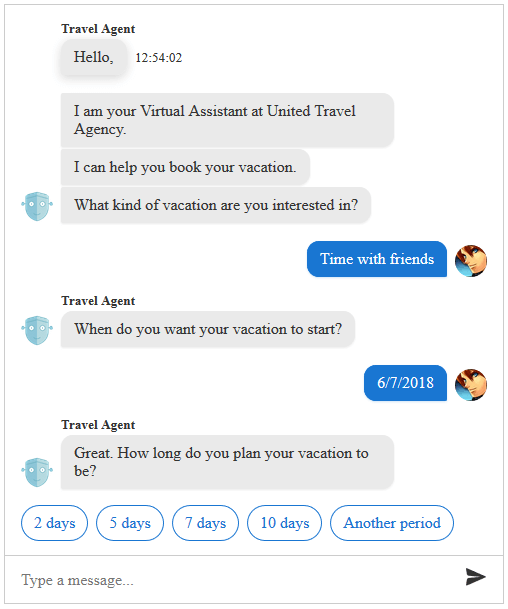 Easy integration with Bot frameworks - Connecting to Chatbot Services via a Chat Agent helper class. To get familiar with the UI elements of the RadChat you can also check the RadChat Structure article.